Software craftsmanship, photography and heuristics. A few of us in Google's Developer Relations group are building a little demo: pwa-directory.appspot.com It's open source and code named Gulliver because it's a PWA directory in the spirit of Yahoo or DMOZ. That means it's not a curated gallery. Instead we recommend that people who just want to see a set of exemplary PWAs should go to the pwa.rocks PWA directory. 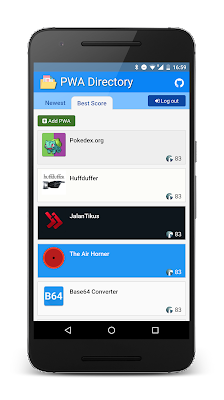 If there's already another PWA directory why are we doing this and what do we hope to achieve? what makes people use a PWA offline? what constitutes a meaningful offline experience? what percentage of our userbase actually uses it offline? which PWA technologies help with acquisition, engagement, retention and re-engagement of users? how do we build a good cross-platform and cross-browser experience? what signals in analytics and Search Console indicate that we are on the right path? what are the things we believe or assume that are wrong? We hope to get 1000 30DAU of this content-centric (lots of pages with URLs) PWA over the next few months. That level of regular usage should start to surface some of the challenges that big web apps face. However this isn't a big web app so our stack is relatively simple. Google sign-in as an anti-spam hurdle for those submitting new sites. The one clever technical feature is that we use Lighthouse As A Service. That means that every time someone submits a manifest (all we require is that the site provide a web manifest over HTTPS) we run Lighthouse inside a headless Chromium instance to collect metrics about the quality of the prospective PWA. If you’re already a Lighthouse user then you may spot that our scores sometimes differ from those you see in Lighthouse. It’s an open issue and we’re working on it. Lighthouse is a big part of this web app’s value so it's going to be the subject of the first in a series of articles sharing the lessons we are learning in building Gulliver. Until then you can get in touch with us via Github if you have questions or feature requests. Why doesn't this blog allow comments? What is the state of the art in Android sharing?